“Goloka, also called Vrindavana, is always full of cows. There are many waterfalls, which are always pouring water, and the sound is so sweet that it covers the sound of the crickets. And because water flows all over, the forest always looks very green and beautiful. 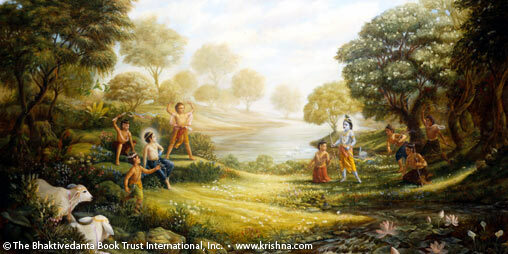 “The inhabitants of Vrindavana are never disturbed by the scorching heat of the sun or high summer temperatures. The lakes of Vrindavana are surrounded by green grasses, and various kinds of lotus flowers bloom there. The air blowing in Vrindavana carries the aromatic pollen of those lotus flowers. When the particles of water from the waves of the Yamuna River, the lakes, and the waterfalls touch the bodies of the inhabitants of Vrindavana, they automatically feel a cooling effect. “Vrindavana is such a nice place. Flowers are always blooming, and there are even various kinds of decorated deer. Birds are chirping, peacocks are crowing and dancing, and bees are humming. The cuckoos there sing nicely in five kinds of tunes.